Get a one-of-a-kind and unforgettable experience during your visit to Siem Reap with this tour by Tuk-Tuk! Experience Cambodia in a completely different way by exploring the temples of Angkor Small Circuit while you're inside a Tuk-Tuk! 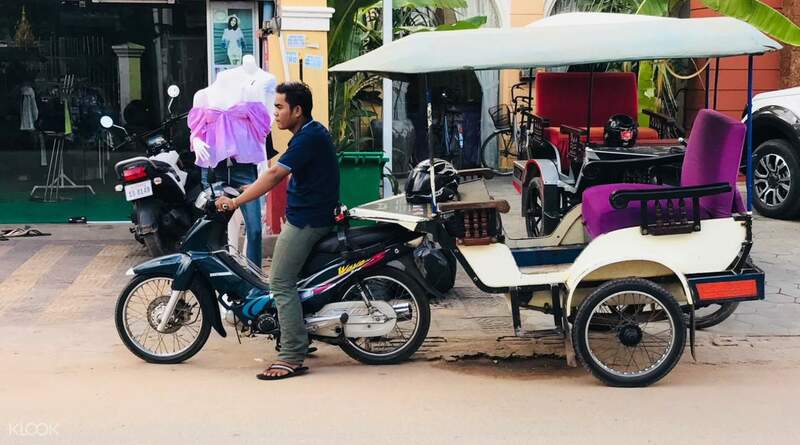 Known as one of the most iconic symbols of Siem Reap, the Tuk-Tuk, which can fit groups of up to 4 persons, is a must-try for anyone looking to immerse themselves in the city's rich and vibrant cultures. 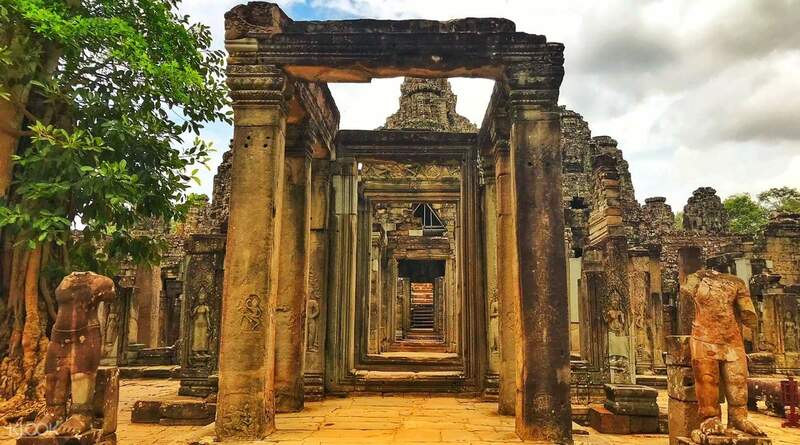 The Angkor Temples tour will start in the morning - you'll get picked up at your hotel, then proceed to the ticket station to purchase your Angkor Passes. 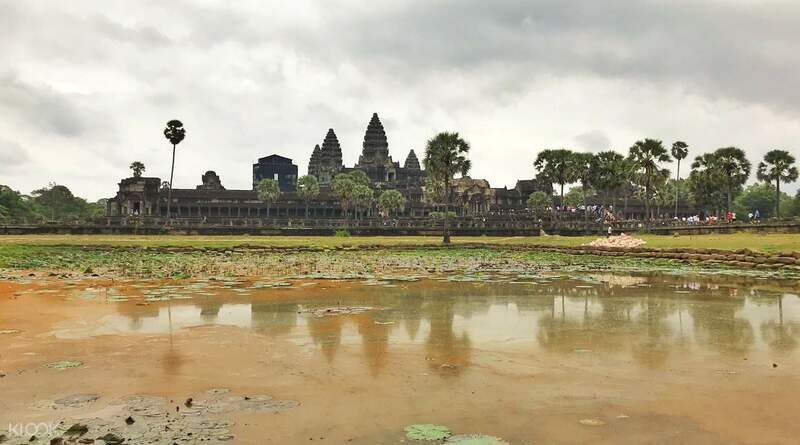 Once you're done, hop on the Tuk-tuk and head to the first stop of the tour, the majestic Angkor Wat, the largest religious monument in the entire world. Marvel at its stunning architecture, with tall towers akin to a flowering lotus bud. Make your way to Angkor Thom and Bayon Temple, surrounded by lush forests and best seen in the morning due to its eastward orientation, before you take a quick break for lunch at a local restaurant, at your own expense. 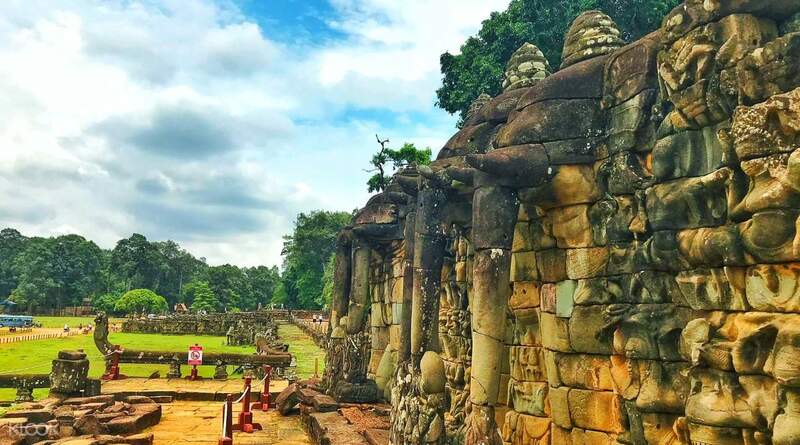 Climb up the Terrace of the Elephants, a 300-meter long platform which was used by King Jayavarman VII to follow games and celebrations, as well as watch his armies return from victory. Check out the architectural beauty and sound designs of the Ta Keo Temple, said to have been left incomplete due to a bad omen after a lightning bolt hit it during construction, and the Ta Prohm Temple, used as a filming location for the movie Tomb Raider. Your last stop for the Angkor Tuk Tuk tour is the Banteay Kdei Temple, which has been overtaken by the vegetation surrounding it, before you head back to the city and get dropped off at your hotel/accommodation. amazing 6-7hrs day.small circuit.excellent day.pick up at 8am in tuktuk.collected tickets.srrived at Angkor wot about 9am.tuktuk driver waited.loads of multi lingual tour guides ($20). 1 1/2-2hr guided tour.very informative.met with our driver and went to next temple.the small circuit has 6. temples.i suggest first two and obviously the temple which appeared in thomb raider.Ta Phom has to be seen to be believed. very exhausting day with lots of steps some very steep but can be missed.take suncream and water and small pack lunch. amazing 6-7hrs day.small circuit.excellent day.pick up at 8am in tuktuk.collected tickets.srrived at Angkor wot about 9am.tuktuk driver waited.loads of multi lingual tour guides ($20). 1 1/2-2hr guided tour.very informative.met with our driver and went to next temple.the small circuit has 6. temples.i suggest first two and obviously the temple which appeared in thomb raider.Ta Phom has to be seen to be believed. very exhausting day with lots of steps some very steep but can be missed.take suncream and water and small pack lunch. The overall arrangement was good. The tuk tuk driver came on time to pick us up at the hotel. We were arranged to visit the main places and have lunch in a very nice restaurant. It was much wash to travel with a tuk tuk driver and tour guide. The overall arrangement was good. The tuk tuk driver came on time to pick us up at the hotel. We were arranged to visit the main places and have lunch in a very nice restaurant. It was much wash to travel with a tuk tuk driver and tour guide. If you want to explore at your own pace without a guide, then hiring a tuk tuk is the best option. This price only covers the hire of the tuk tuk for the day, you will still need to buy your pass to the Angkor site. We opted for a one day pass. There are many checkpoints within the site so you will need to have your pass available to get into each. At each checkpoint to get into a temple, they will also offer you a guide, so if you are really interested to know more about thay certain temple, you can always pay extra for a guide there. Our tuk tuk driver was on time, knew the circuit and we were offered two bottles of water each during our trip which was great. Definitely a must see. If you want to explore at your own pace without a guide, then hiring a tuk tuk is the best option. This price only covers the hire of the tuk tuk for the day, you will still need to buy your pass to the Angkor site. We opted for a one day pass. There are many checkpoints within the site so you will need to have your pass available to get into each. At each checkpoint to get into a temple, they will also offer you a guide, so if you are really interested to know more about thay certain temple, you can always pay extra for a guide there. Our tuk tuk driver was on time, knew the circuit and we were offered two bottles of water each during our trip which was great. Definitely a must see. Great for a solo traveller like me! You come and go whenever you want to :) Free bottled water at the end of the trip as well! Started and ended it on time. Our tuktuk driver was really helpful and patient, very friendly too! Worth it!!! Great for a solo traveller like me! You come and go whenever you want to :) Free bottled water at the end of the trip as well! Started and ended it on time. Our tuktuk driver was really helpful and patient, very friendly too! Worth it!!! No problems - chose a tuktuk coz of small kids. We did 4 of the 5 temples skipping the last due to bad knees! We had a guide at Angkor Wat for $15 USD worth the hour and a half. We had no guides for the next 3 temples. Driver was early in the morning and we were back in hotel pool by 2PM. No problems - chose a tuktuk coz of small kids. We did 4 of the 5 temples skipping the last due to bad knees! We had a guide at Angkor Wat for $15 USD worth the hour and a half. We had no guides for the next 3 temples. Driver was early in the morning and we were back in hotel pool by 2PM. This small circuit tour is surprisingly very tiring, so be prepared, wear only comfortable clothes & sandals. It can get very hot on the temples while exploring. Our driver is very nice, he may speak little english but we appreciated the effort he made by making us feel comfortable during the tour. This small circuit tour is surprisingly very tiring, so be prepared, wear only comfortable clothes & sandals. It can get very hot on the temples while exploring. Our driver is very nice, he may speak little english but we appreciated the effort he made by making us feel comfortable during the tour. Our tuk tuk driver was very punctual and very polite. He explained to us out itinerary and the meet up points afterwards. The trip went really smoothly and we were able to see the 7 temples that was in our itinerary. It was very convenient as we only had one day to go around the temples. Bottles of water was also provided which was very kind. Excellent service! Our tuk tuk driver was very punctual and very polite. He explained to us out itinerary and the meet up points afterwards. The trip went really smoothly and we were able to see the 7 temples that was in our itinerary. It was very convenient as we only had one day to go around the temples. Bottles of water was also provided which was very kind. Excellent service! My third day of temple-hopping. The driver just let us visit each temple at our own pace. We even finished this tour earlier thanks to our driver. Also booked the grand circuit tour. Both tours are amazing. My third day of temple-hopping. The driver just let us visit each temple at our own pace. We even finished this tour earlier thanks to our driver. Also booked the grand circuit tour. Both tours are amazing.